This is a collection of nine short stories. 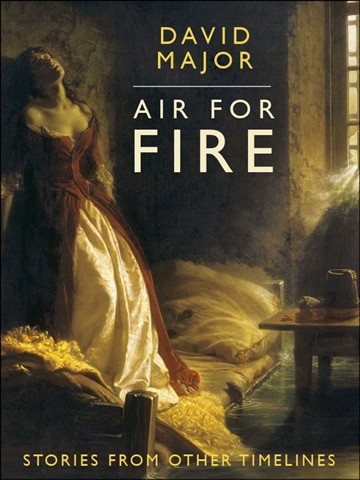 While The Day of the Nefilim was a meandering trip through some of the world’s great conspiracy theories and New Age tropes, Air for Fire is a collection of short tales that happen in every timeline but this one. Shameless historical revisionism, a chronic disregard for physics, all in orbit around a thoroughly judgemental and conservative core, mean there is something here for steampunks, mythpunks, clockpunks, and all indulgers in history, true or otherwise. There was once a girl — excuse me, a young woman, you decide — who on account of having no excuse at all for an episode of bad behaviour, bad language, and bad attitude, was sent to her room. Not straight to her room, which is to say, without dinner, because none of the behaviour, language, or attitude were irredeemably atrocious or outrageous — but the whole package, considered together, was of the type about which grown-ups eventually, and quite rightfully, come to the conclusion that they have just had enough. I have been told that we have been building this tower for thousands of years. I have no direct experience; no reason to believe this — nor to doubt it — but it is what I have heard, and I can see a little way into the waters that keep rising, lapping below our feet as we keep building, board after board, nail after nail.